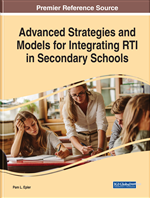 This chapter focuses on a struggling high school in a rural Kentucky community that made a dramatic turnaround within 2 years after establishing response to intervention structures to support both teachers and students. The principal, special education director, other administrators, district personnel, school improvement specialists, teacher leaders, and school faculty implemented changes that were responsible for the turnaround and for sustaining this success. High expectations, a positive school culture, professional development, guided planning, student assessment, data analysis, research-based intervention programs, and a systems change approach are some of the contributions that led to widespread improvements at the school level and in individual student gains. During the timeframe in which the turnaround occurred, the case study high school was the only high school serving students in its county. The school was located in a rural area with a county population of approximately 16,000 community members. The school had around 900 students enrolled, and the ethnic diversity of the student population was as follows: 83% Caucasian, 13% African American, 1% Asian, 1% Hispanic, and 2% other ethnicities. Forty percent of the students qualified for free or reduced-cost lunches (although that number was expected to rise), and 13% were identified as having disabilities. Walkthrough Observations: Informal observations by school leaders to gather evidence on the implementation of PD and determine future professional learning. Hub School: A school that serves as an example for school improvement to the rest of the state. Co-Teaching: General education and special education teachers planning and delivering instruction to a group of students. Differentiated Professional Development: Professional learning opportunities that appeal to teachers’ interests and areas of growth and provide choice to meet the variety of needs within an academic setting. Non-Negotiable Expectations: Clearly defined changes required for transformation, including weekly guided planning with teachers, administration meetings, biweekly content area meetings, and PD on key principles of effective teaching. Guided Planning Periods: A 25-minute time once a week in which teachers learn skills to improve lesson planning and instructional practices. Plan, Do, Study, Act (PDSA): A systems approach to school improvement involving planning and developing the system, implementing the system, studying its effectiveness, and then refining the system. Data Analysis Process: Examining students’ formative assessment data, identifying strengths and obstacles, established new learning goals, selecting common instructional strategies for groups of students, and developing result indicators to measure and monitor learning. Academic Time: A 30-minute intervention time built into the school schedule to provide differentiated opportunities to support students in their learning. Common Assessments: Assessments in similar classes designed to determine students’ progress toward standards mastery. Positive Behavior Interventions and Supports (PBIS): An approach to establishing behavioral and sociocultural supports to promote academic success within a school for all students.